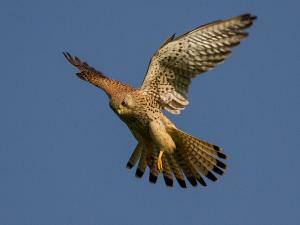 A team of mechanics have rescued a kestrel from the grille of a car in a rather unusual turn of events. The vehicle's driver was travelling down a road near Downham Market in Norfolk when the bird became trapped after flying into the front of the car. Unable to release the bird himself the driver continued to a nearby garage, Graham Gillis Auto Repair to seek help. Fortunately, the team were able to remove the bird. It's a pretty unusual case, but just goes to show that you can never be too sure what will happen at a garage each day so a comprehensive motor trade insurance policy is vital to cover staff and vehicles for injury and damage. That said, it's unlikely the Graham Gillis team will be dealing with another trapped bird again. Craig Plumley, animal welfare officer with the RSPCA, told the BBC that it is the first time he's known about this kind of incident happening in the 19 years he's been working with the charity. The bird is said to be making a good recovery and has no broken bones. It is hoped that it will be released into the wild again soon.